Should Online Newspapers Remove Compulsory Registration ? 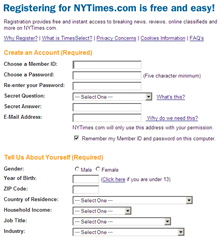 More and more news websites are asking visitors to register to read online content. Some sites like The Washington Post and The New York Times require just an email-address while The Wall Street Journal charges a monthly fee from users. Currently our site has compulsory registration [free]. I have been recommending [to management] they remove the registration requirement. By what percentage do you think traffic will improve if we were to remove registration? They are willing to remove registration if we are going to enjoy 35-40% spurt in traffic. » The main purpose of registration is to get an idea about the profile of your site readers like what's their income group, age, interests, etc. Is anyone honest while filling those long registration forms ? If not, what's the point in collecting junk data. » BugMeNot is still alive and kicking. » A key factor in good search rankings is inbound links. If your news article is wrapped with a registration barrier, very few people will link which will ultimately effect your site's ranking in search results. Less visitors (or lesser page views) will translate into lower advertising income. According to Google, 200,000 webpages are linking to CNN.com but the WSJ has around 45,000 inbound links - CNN is way high partly because their content is accessible without registration. Online publishers may go for an "optional registration" model - every visitor be allowed to read the news stories (including those in the archives) but if they register, they get access to some goodies like email newsletters, real-time alerts, personalized news sections, ability to track news based on keywords, etc. And if you ever need reader demographics, just run a simple contest with some great prizes like Apple iPods.